Marianne’s PhD topic deals with the development of a simulator for Craniomaxillo-Facial Surgery. For presenting her recent results to the community, she attended the annual meeting of the Austrian Society of Craniomaxillo-Facial Surgeons (ÖGMKG) and the PMU Science Get Together. The “Paracelsus Science Get Together”, which was held at the Paracelsus Medical University Salzburg at 24th of June 2016 for the 7th time, is a open forum for researchers in the wide field of medicine and health. Researchers from the PMU, Salzburg University, University of Applied Science Salzburg and other research institutions in the region had the opportunity to interact in an informal and collegial atmosphere to present their latest research results. 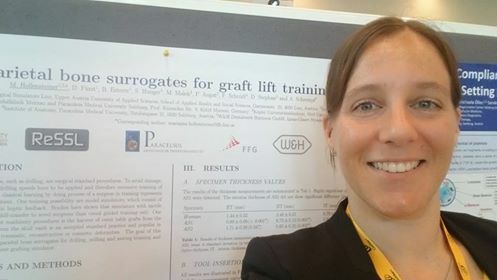 Marianne participated and presented her poster “Parietal bone surrogates for graft lift training”.